A brand that is committed to improving the quality of your life, True Elements provides food that is packed with the goodness of nature and taste that will keep you wanting for more. 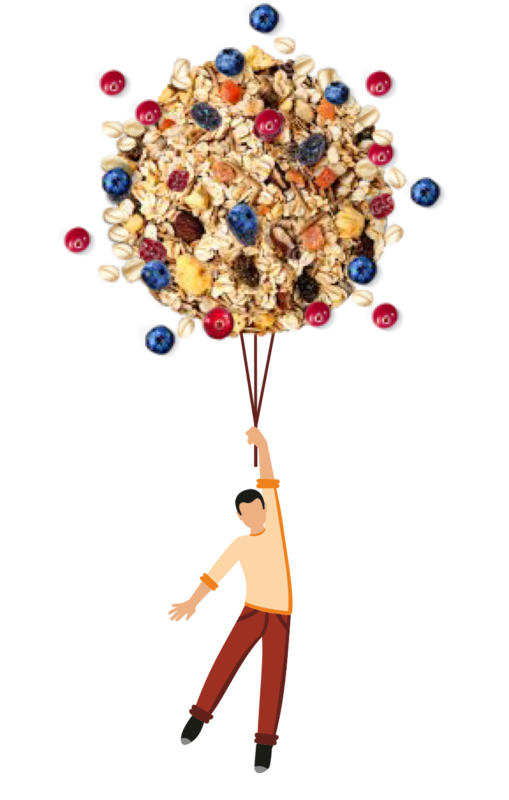 With a range of food items across categories like Breakfast Cereals, Grains & Raw Seeds, Roasted Snacks and other healthy items, each of our products is not only 100% Natural but is also made of 100% Whole Grains. While we stand strongly for Health, wherein our products have a clear functional benefit, we believe that Taste is the most important element when it comes to Snacks. We strive to bring the best range of snacks to you. Go ahead and check us out to know more about what we offer! Why do we need True Elements in our lives? We all want to be on top of the world. Want to be better at whatever we are doing. Better, not only than others but better than our own self. We want ‘that’ position, ‘that’ salary, ‘that’ lifestyle, ‘that’ vehicle, ‘that’ house, ‘that’ kind of family, ‘that’ life! In all this pursuit of ‘that’, we ignore the main ‘hero’ who would do all this, “Me”! We get bogged down by millions of things others want from us. Our moods define the quality of life we live, the people we are surrounded by, and the way they interact with us. We forget what keeps us charged and fit. We forget what keeps us energized and brings the confidence in us to move forward in life. The food we consume does not really get our attention. In a world where each one of us is always in a hurry to reach their destination on time, we eat whatever we can manage and whatever works for us! Sometimes relishing a quick snack and 'cutting' at a tea vendor outside the station or sometimes sipping a hot Cappuccino at a Starbucks. Whatever seems enticing and appetizing, we desire to be served on our tables. We crave for nutty crunchy ice creams or mouth-watering pizzas bursting with cheese and spices and consume it whenever we wish to, without any guilt. Who said don't eat all this? But even after getting satiated with our cravings, our stress levels don’t reduce. We still fall short of the energy required, the confidence, hope and positivity to move forward. We still find ‘that’ happy world elusive. Why not eat something that makes you live life the way you want? Not longer but better. A better and smiling life that makes you do what you want and not what others want from you. Get back to your Natural Self – Live your life ‘your’ way. Stay Natural and Lead a Happy Life. Eat food the way Nature has made for you. Eat food which calms you down, satisfies your palate, reduces your stress and enhances your lifestyle. Don't eat chemistry books, but rather go for something which lets you stay the way you are. Eat food that makes you stay the way you are - Naturally! Committed to enhancing your quality of life, True Elements aims to bring positivity, hope & confidence through food that is packed with the goodness of nature and taste that will keep you wanting for more. True to Nature. True to you.